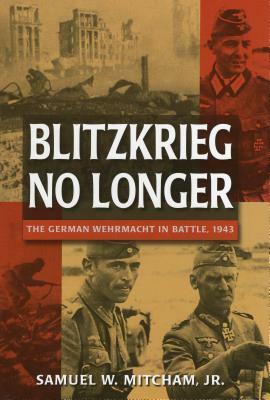 Blitzkrieg No Longer: The German Wehrmacht in Battle, 1943 by Samuel W. Mitcham Jr.
We’d love your help. Let us know what’s wrong with this preview of Blitzkrieg No Longer by Samuel W. Mitcham Jr.. Preview — Blitzkrieg No Longer by Samuel W. Mitcham Jr.
To ask other readers questions about Blitzkrieg No Longer, please sign up. Fascinating review of the scope of the German military at this key point of the war. Sometimes gets caught in the details of the military structure, but fascinating inside on the numerous conflicts between Hitler and his generals, the logistics of fighting on such a large scale, and insights on failed strategy by both sides - like the bad idea to invade the Italian mainland. Great lessons on the key elements starting the end of the Third Reich. Good look at 1943 from a German perspective. While the book takes a grand strategic perspective in that it encompasses all the fronts, the most interesting and memorable accounts are details of specific actions. The analysis of North Africa through the arrival at the Gustav line is the most interesting and perceptive thread in the work. About Samuel W. Mitcham Jr.
Books by Samuel W. Mitcham Jr.